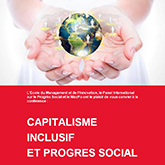 In a long-term partnership, the Max Planck Institute for the Study of Societies (MPIfG) and Sciences Po, including its affiliated institutes – the Centre d’études européennes (CEE), the Centre de sociologie des organisations (CSO), the Centre d’études de relations internationales (CERI), and the Observatoire sociologique du changement (OSC) – organize joint conferences, workshops, and seminars on mutual research topics in Cologne and Paris to foster both the exchange of ideas between the two partner institutions and the integration of Franco–German research traditions. 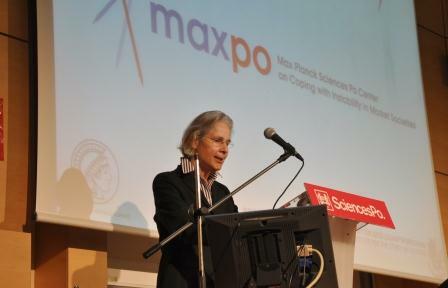 Occasionally, MaxPo participates in the organization of international symposia on themes within our fields of interest. This seminar aims to familiarize students with the literature on neoliberalism in a range of fields from political science and political sociology to economic and social history. It also aims to shift bounda-ries of thinking around neoliberalism from a Western problem to a wider governmental and global project. In the seminar, students will gain an understanding of the cultural expressions of forms of marketization, the use of market devices as forms of both social mobility and social control, and the shifting relationship between political and economic elites in different contexts since 1970. Through the long postwar period, crisis was a conjectural phenomenon, exceptional in a normalcy of growth and social progress. Many key concepts of the social sciences – indeed, our understanding of democracy, of embedded markets, of enlightened electorates, benevolent political elites, and problem-solving progressive alliances – seem inapt for understanding the current societal upheaval. In the wake of the financial crisis of 2008, we have witnessed majority alliances breaking down, populism returning on a grand scale both in the Western world and globally, and the new patterns of social mobilization erupting into chaotic and sometimes violent protest. The forces that underpinned the framework of welfare capitalism seem obsolete in the face of financial and political elites that are paradoxically both disconnected from national territory and sometimes in direct alliance with nationalist and populist movements. Politics of resentment, politics of place, and new politics of class interact in ways that we do not yet understand. Perhaps the greatest paradox of all is that neoliberalism has spawned authoritarianism. At the same time, these processes are not at all new, but must be put in the context of the socioeconomic and cultural cleavages produced by the shift to neoliberalism since the 1970s. The conference addresses the different facets of social destabilization that we observe today. It marks the fifth anniversary of the founding of MaxPo, the Max Planck Sciences Po Center on Coping with Instability in Market Societies. Presentations will analyze different aspects of the overarching phenomenon of social destabilization trying to identify common threats in the diverse developments currently to be observed. Workshop 8 – Joint Workshop Series "States and Markets"
Workshop 7 – Joint Workshop Series "States and Markets"
In April 2015, Sciences Po and the MPIfG held a joint workshop in Cologne as part of the "States and Markets" series. The workshop on "Politics and Society in the Age of Financialization" was attended by some twenty political and social scientists from Germany and France. Financial markets, their regulation, and the effects of finance on households have become major research fields in economic sociology and political economy. Financialization has been identified as a major trend in socioeconomic development. The financial crisis of 2007 and its repercussions on the economy, the state, and households have sparked interest in political science and sociology to understand the operation of financial markets and possibilities for their regulation. At the workshop in Cologne, scholars from both disciplines presented their findings on the effects of the financial crisis on the economy, state, and society as well as the possibilities for regulating financial markets. Workshop 6 – Joint Workshop Series "States and Markets"
If economies may be generated and transformed through moral struggle, moralities may also be constituted through economic means. 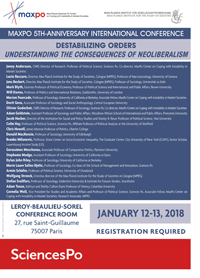 This conference brought together advanced students and postdocs from UC Berkeley, Sciences Po (CSO and MaxPo), and the Max Planck Institute for the Study of Societies to consider intersections between morality and economy in a series of topical areas, including contested markets, finance, nature, and culture. Workshop 5 – Joint Workshop Series "States and Markets"
The last thirty years have seen profound shifts in the social organization of Western societies. Today individuals are increasingly exposed to market forces in a growing number of life spheres. Cultural shifts that accompanied this "marketization" have led to a more individualized culture and the destabilization of traditional social structures, for instance in the family. Creating a growing sense of uncertainty, these developments have led to pressures on individuals, organizations, and politics to cope with increasingly instable economic, social, and political environments. Workshop 4 – Joint Workshop Series "States and Markets"
Workshop 3 – Joint Workshop Series "States and Markets"
Workshop 2 – Joint Workshop Series "States and Markets"
Workshop 1 – Joint Workshop Series "States and Markets"
In recent years, the nature of neoliberalism as a concept has been highly debated in the social sciences. Crude understandings of neoliberalism as something “bad” have been replaced by more sophisticat-ed interpretations of how the process of marketization can be understood as a universal phenomenon and as highly particularistic and contingent in different national settings. As a general rule, the Nordic countries are almost completely absent from the literature on neoliberalism. In the comparative welfare state literature and political economy, the Nordics still figure as an exception to liberalization processes, particularly to the Anglo-Saxon countries. A workshop entitled “Neoliberalism in the Nordics: Developing an Absent Theme” organized by Jenny Andersson (MaxPo), Mitchell Dean (Copenhagen Business School), and Chris Howell (Oberlin College) will take place in December 2018 at MaxPo. 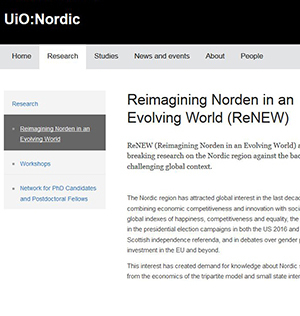 Supported by ReNEW (Reimagining Norden in an Evolving World at the University of Oslo), the workshop seeks to develop a new research theme around neoliberalism in the Northern European periphery. Read more on the ReNEW website. The international conference "Pricing Practices, Ranking Practices: Evaluation in Economic Life" explored a variety of subjects related to the question of evaluation, from compensation practices to cultural algorithms. If American, French, and other European scholars working on evaluation come together, what can be learned about the construction, implementation, and consequences of pricing and ranking practices in the modern world? The conference was organized in cooperation with EHESS, ENS, Université Paris 1 Panthéon-Sorbonne, CNRS, Paris School of Economics, Collège de France, MaxPo, Paris Sciences et Lettres Research University, and Centre pour la Recherche Économique et ses Applications. This symposium brought together several studies focusing mainly on financial work and encompassing various actors in the field of finance. One focus was on the financiers themselves, such as financial directors, financial analysts, auditors, consultants, traders, and asset managers, in a range of organisations such as banks, audit firms, consultancy firms, private/public limited companies, and rating agencies. Another was on professionals whose work is connected to that of the financiers. Video of the roundtable discussion "Moral Categories in the Financial Crisis"
Using the recent financial and eurozone crises as empirical backgrounds, the panelists Marion Fourcade (MaxPo), Philippe Steiner (University of Paris-Sorbonne), Wolfgang Streeck (MPIfG), and Cornelia Woll (MaxPo) proposed four different perspectives on the play of moral judgments in the economy, and called for broader and more systematic scholarly engagement with this issue. 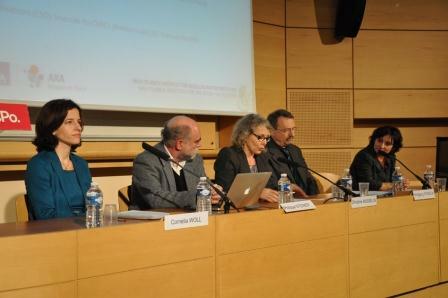 The discussion was chaired by Christine Musselin of the Centre de sociologie des organisations at Sciences Po. The MaxPo Center opened in October 2012. The co-directors decided to organize an academic public event at which to introduce their agenda to the Center’s academic and administrative partners as well as to the broader community interested in the topic of "Coping with instability in market societies." With the full support of the German Embassy and the French Ministry of Higher Education and Research, the inaugural event took place at Sciences Po on November 29, 2012. The date was chosen to fit with the event schedule surrounding the fiftieth anniversary of the Élysée Treaty between France and Germany. 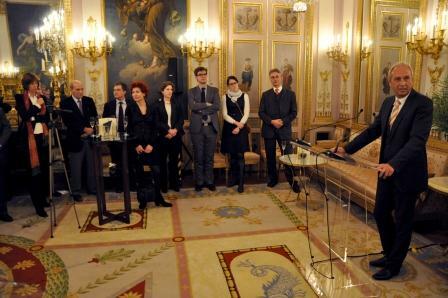 The interim director of Sciences Po, the president of the Max Planck Society, the ambassador of Germany to France, the undersecretary for Research and Innovation of the French Ministry of Higher Education and Research, the director of Institutional and European Affairs of the Axa Group, and the two directors of the MPIfG participated in the inaugural ceremony, which took place in one of Sciences Po’s largest rooms and was followed up by a reception at the German Embassy. The academic part of the inaugural event centered around a panel discussion on moral categories in the financial crisis. Political Economy: What’s the Value Added? 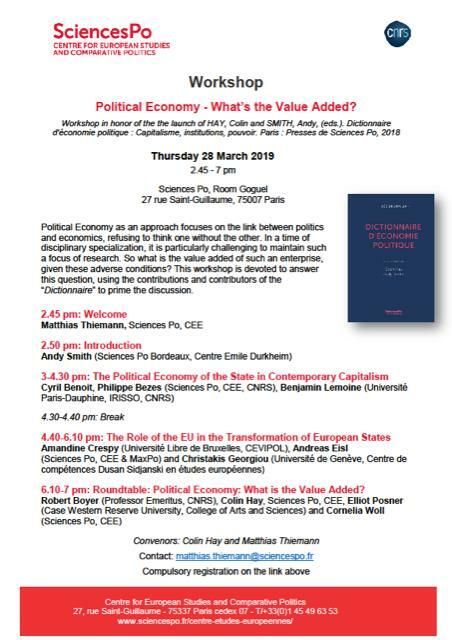 Workshop in honor of the launch of the "Dictionnaire d'économie politique: Capitalisme, institutions, pouvoir," edited by Colin Hay and Andy Smith (Presses de Sciences Po, 2018). Political Economy as an approach focuses on the link between politics and economics, refusing to think one without the other. In a time of disciplinary specialization, it is particularly challenging to maintain such a focus of research. So what is the value added of such an enterprise, given these adverse conditions? This workshop is devoted to answer this question, using the contributions and contributors of the “Dictionnaire d'économie politique: Capitalisme, institutions, pouvoir," to prime the discussion. Monday, November 5, 2018 | 5−7 p.m. Debate around the conclusions of the International Panel for Social Progress (IPSP) and the book "A Manifesto for Social Progress: Ideas for a Better Society"
This workshop, co-organized by MaxPo and the Futurepol project within the framework of Jenny Andersson’s MaxPo research group, brings together intellectual and economic historians, historians of science, anthropologists, and sociologists around the problem of prediction. It aims to understand what prediction is, the modes of anticipation that it enacts, and the forms of scienticity and non-scienticity it deploys. It also aims to understand prediction as a particular technology of world ordering, market making, and society crafting. Modern economies are oriented towards the future, and in many circumstances the future is inherently uncertain. This raises questions about how economic actors form expectations or strategies, assess the likely outcome of their decisions, and learn to exploit the indeterminate future to their advantage. How do economic actors make decisions when the future is indeterminate because it has yet to be created by the innovations they and others will make, or because it is so complex that it cannot be anticipated? Some thirty researchers met at the tenth Max Planck Summer Conference on Economy and Society in Reims to discuss "Territories of the Economy." Presentations addressed the political economy of international adoption, the relationship between prosperity and public debt, the effects of natural disasters on election results, labor policies in the era of liberalization, and the growth of major cities. As keynote speaker, Michael Storper (UCLA and LSE) presented his new book comparing the transformation of San Francisco and Los Angeles. Lazslo Bruzst of the European University Institute in Florence closed the conference with his talk on single market integration in Europe and on economic change at Europe's periphery. Since 2006, a rotating summer school brings together senior scholars and doctoral students from Sciences Po, the Max Planck Institute for the Study of Societies in Cologne, Northwestern University and other partner institutions in certain years such as Harvard University, Columbia and the European University Institute in Florence. Mixing keynote speeches and PhD presentations, the conference focuses on questions at the intersection of economic sociology and political economy. In the current era, information and interactive technologies are not exogenous to organization. In fact, organizational design - and consequently state structure and the design of social and industrial policy - has become inseparable from the design of the digital interface. The workshop addressed the interactions of technology and economy and how these disruptions give rise to new challenges and new opportunities for democracy. During the three-day conference, 14 young researchers from the participating institutions presented their ongoing research projects. Monday, July 1, 2013 to Wednesday, July 3, 2013 Economics and Democracy: Are They Still Compatible? Do democratic politics and economics remain compatible, now that financial, economic, and debt crises have grown out of the liberalization of the 1970s? At the 2013 Summer Conference, the doctoral students' presentations shed light on such issues as second-generation immigrants' lives in Western Europe, neoliberal reforms in Russia's higher education, land dispossession in Mexico, and the governing of slums in Paris and Madrid. Marie-Laure Djelic of ESSEC Business School in Paris contrasted "doux commerce" and "ineluctable alienation" in her keynote address on "democratization and neoliberal governance," and Mark Blyth of Brown University in Providence, USA, discussed lessons from the eurozone crisis. Subscribe to our MaxPo events RSS feed to get events delivered straight to your desktop.